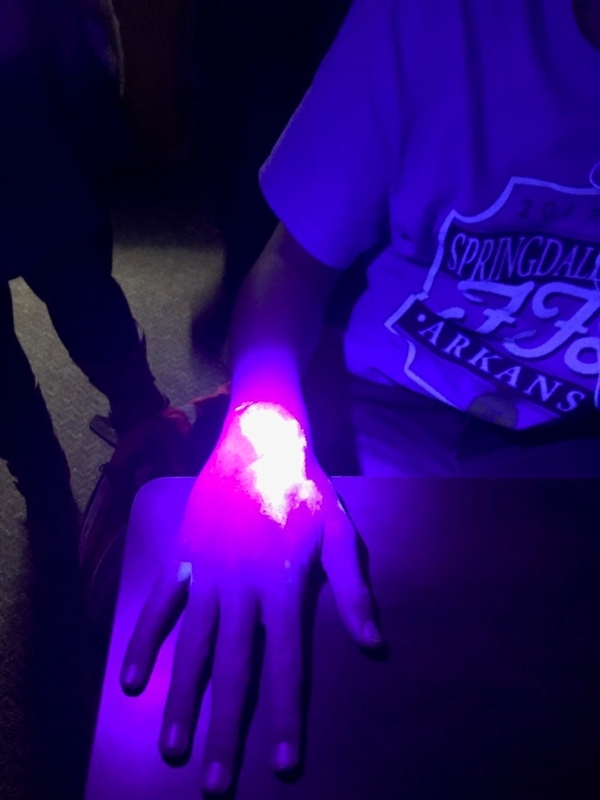 An ultraviolet light and Glo Germ powder was used to illustrate how quickly germs can be spread during a food science outreach experiment at Har-Ber High School. FAYETTEVILLE, Ark. – Rosa Buescher from the U of A's Dale Bumpers College of Agricultural, Food and Life Sciences recently hit the road to spread, not germs, but germ education to high school students. Buescher is the student relations coordinator for the college's Department of Food Science, and was invited to Har-Ber High School recently to talk about food safety, food science careers and STEM (science, technology, engineering, mathematics) education. Buecher, a bachelor's and master's degree graduate of the food science program, spoke in three of Kelley Keith's AP biology classes, and gave demonstrations on how quickly germs can spread throughout a room in 30 minutes. She also emphasized the importance of hand washing to eliminate germs, and prevent the spread of germs and bacteria. Glo Germ powder was used, which glows under ultra violet light. In a "Germs That You Can See" experiement, the powder was applied to a high school student, who was sent around the room to help with a variety of tasks, including shaking hands, high-fiving, passing out papers and getting signatures. Thirty minutes later, the ultra violent light revealed the spread, which went from hands to faces, drinks, phones and more. "The goal is to teach proper hand washing, aseptic techniques and general infection control," said Buescher, a former successful restaurant owner in the area. "In the food industry, we teach our employees the critical nature of these simple techniques to prevent food contamination. In school, we should teach the students the same. This could lessen the flu, strep and stomach viruses that spread every winter." Keith has taught biology for eight years and before that was a microbiologist at Tyson Foods Inc. for 10 years. Buescher also worked at Tyson, in Food Safety and Laboratory Services.